We all see have seen the spectacular runs made by Trent Richardson over the last two years, however you may not have realized that Trent likes to share his Christian faith. 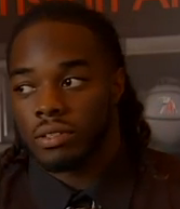 The Crimson Tide's star RB spoke recently at a FCA Luncheon in Mobile. The goal was to encourage others to put football in the right perspective. In times of tragedy, football seems a lot less important. He said that it is important for athlete's to get their "sin's out of the way, get forgiveness, and to read the Bible every once and a while."